If you check your social media feeds or local news shows, you’ll find that home organization and storage streamlining has never been more popular. 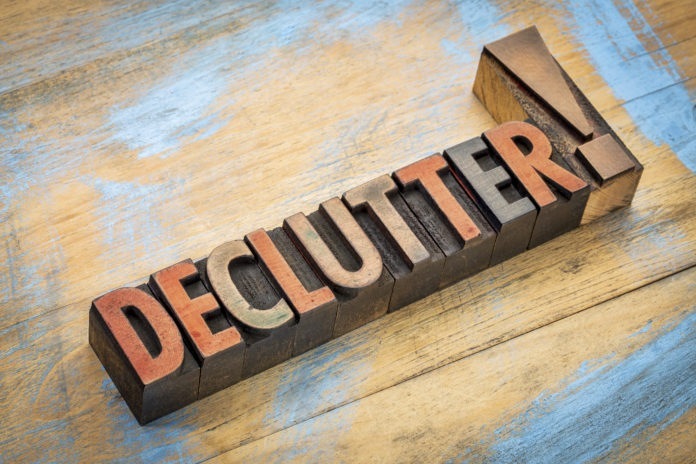 Are you also looking to get in on the decluttering craze? There are many great tips floating around for how to start the decluttering process, but here are a few things to remember NOT to as you say goodbye to the things that no longer bring you joy. Sure, you may want to declutter and organize your entire home, garage, basement and/or attic, but do you really have time to invest in that large of an undertaking? If you have a finite amount of time, start with one closet or room. Aside from the physical activity involved, strolling down memory lane can be emotionally tiring, and you may find that your focus is trailing after only a few hours. You want to finish your first area motivated to do more as soon as you are able, not dreading the process. The benefit of starting with one area is that you can manage your time and finish one section completely before losing your inclination to clear things out. After you have finished sorting into “keep,” “donate,” and “trash” piles, finish the job by physically removing things to their new location. Make a trip to your trash and/or recycle bins immediately. Load your donations into your car and if possible, deliver them right then. This clears the area completely for you to organize what is left, and it closes the door on second-guessing your initial decisions. The reason the closets and drawers on the professional organizing videos look so perfect is because they are – for a reason. A professional organizer’s home or the set of a decluttering show will look much different than yours, because they are staged for the camera, and often are not lived in by actual people. If you make perfection your goal, you’ll likely be disappointed, and discouraged from future efforts. Set a realistic goal for a storage system that will fit with your family and your life. As you prepare to embark on your decluttering journey, you may be tempted to purchase a collection of storage boxes and bins, or attractive home decor storage items for stashing your treasures out of view. None of these things will benefit you if you haven’t first decided what, where and how much you need to store. Experts recommend starting the process first and weeding out the things you will be trashing and donating. Once you see what you are left with, then it will be easier to determine the appropriate storage method. You may find that you enjoy the decluttering process, but that doesn’t mean you want to do it again any time soon. Make a commitment to yourself that you will maintain the organizational system you put in place. Create a system for processing all of the items that enter your home, and don’t allow them to linger in temporary locations. Are you decluttering because it’s time to move your treasures to a new home? Check out our current listings here!